About 11 o'clock in the night, while off North Carolina coast, say 30 miles from land, weather moderate and night dark, the starboard boiler exploded, and the vessel was lost, with all the passengers and crew except those whose names are enumerated among those saved in the list to be found below. We have gathered the following fact from the first mate, MR. HIBBERD, who had charge of the boat at the time. MR. HIBBERD states that about 10 o'clock at night he was called to the command of the boat, and that he was pacing the promenade deck in front of the steerage house; that he found him. If, shortly after, upon the main deck, lying between the mast and side of the boat; that upon the return of consciousness, he had a confused idea of having heard an explosion, something like that of gunpowder immediately before he discovered himself in his then situation. He was induced, therefore to raise and walk aft, where he discovered that the boat midships was blown entirely to pieces that the head of the starboard boiler was blown out, and the top torn open; that the timbers and plank on the starboard were forced asunder and that the boat took in water whenever she rolled in that direction. Both boats now insisted upon MR. HIBBARD'S directing their course to the shore, but he resisted their remonstrances, replying that he would not abandon the spot till day light. At about three o'clock in the morning they started amidst of the wailing of the hopeless beings who were floating around in every direction, upon pieces of the wreck, to seek land, which was about thirty miles distant. After pulling about thirteen hours, the persons in both boats became tired, and insisted that MR. HIBBARD should land. This he opposed, thinking it safest to proceed along the coast, and to enter some of its numerous inlets; but he was at length forced to yield to the general desire, and to attempt a landing upon the beach a little east of Stump Inlet. "So far as I have ascertained there were 131 passengers -- 54 saved in all; 77 lost." 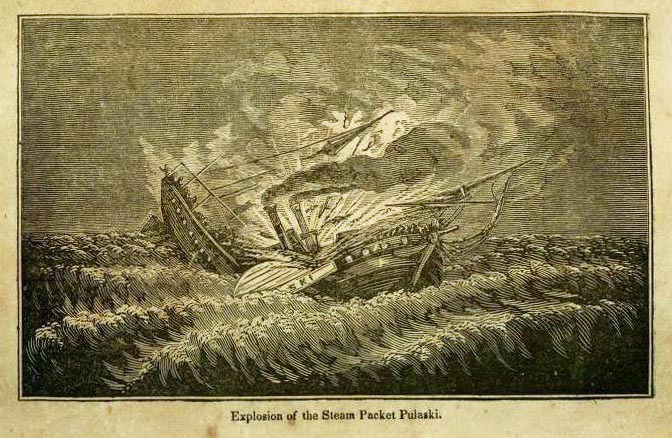 In 1838, the steamship Pulaski sank off the coast of North Carolina when her boiler exploded, but two of her passengers discovered survival skills and each other. Steamship boilers often exploded, fatally scalding passengers and crew, and furnishing maritime history with countless disaster stories. The sinking of the steamship Pulaski off the coast of North Carolina on Wednesday and Thursday, June 13-14, 1838, marked one of the first explosions of a coastal steamship, but with a romantic twist if a Brooklyn Eagle account of two survivors is more than a legend. The Savannah and Charleston Steam Packet Company built the Pulaski to safely and speedily carry freight and passengers from Savannah, GA to Baltimore, MD with pick up stops in Charleston, SC. Advertisements in newspapers of the day touted the marvels of the Pulaski’s 225 horse power engine and her copper boilers as well as her spacious accommodations for passengers. According to the Wilmington Advertiser newspaper story, on Wednesday, June 13, 1838 (see below) the Pulaski, with Captain Dubois at the helm and a crew of 37 seamen and a contingent of passengers, left Savannah, GA bound for Baltimore, MD. After boarding about 65 more passengers in Charleston, SC Captain Dubois set the Pulaski’s course for Baltimore. The Pulaski steamed to about thirty miles off the North Carolina coast through a dark night and moderate weather. Passengers clung to furniture and pieces of wreckage. As the Pulaski sank, the crew lowered four life boats, with two capsizing while the other two filled with frantic passengers. Forty-five minutes after the boiler explosion, about half of the Pulaski’s passengers had drowned, were scalded to death or crushed by the falling masts. The people in the two lifeboats searched for survivors most of the night, and with daybreak, rowed toward the North Carolina shore. One of the lifeboats capsized in sight of land, but the other landed safely after fighting crashing breakers. Other survivors still floated in the Atlantic Ocean. Major Heath and second captain Pearson built a makeshift raft by lashing wreckage together with ropes and welcomed 22 people aboard. The survivors clung to the raft and endless Thursday, Friday and Saturday, suffering from hunger and thirst and exposure to the relentless waves. Four more survivors who had clung to wreckage climbed aboard the raft on Saturday morning. Hope revived the exhausted spirits and bodies of the survivors when they spotted the Carolina coast line, but the fierce wind swept away their hopes as quickly as it swept the raft back to sea. After a stormy weekend, Monday morning dawned calm and clear and Monday afternoon brought sightings of four ships, but no rescue. Tuesday morning brought another sighting of sails on the horizon. The Henry Camerdon, a schooner bound for Wilmington, NC, rescued the 26 survivors and eventually picked up four more survivors clinging to a smaller piece of wreckage. According to the Brooklyn Eagle story, a Mr. Ridge from New Orleans and a Miss Onslow from a Southern state, were two of the passengers who were picked up on Saturday morning about fifty miles from land. When the Pulaski’s boiler exploded, Mr. Ridge had given himself up for lost when he spied a coil of small rope. He grabbed it and lashed a piece of an old sail, a couple of settees, and a small empty cask together with it and launched himself and his raft upon the cold Atlantic. Sighing with relief, he looked down into the water and saw a woman struggling in the water at the side of his raft. He dove into the water, swam to her, grabbed her and hoisted them both onto his makeshift raft. The woman he rescued turned out to be Miss Onslow, the young lady that he had admired from afar earlier in the voyage. 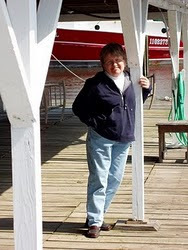 Soon one of the small lifeboats floated toward them, and although it already had a heavy load of people, Mr. Ridge implored them to take Miss Onslow aboard. She refused to leave him. Together they suffered scorching heat and the lack of a morsel to eat or a cooling drink of water. resourcefulness in saving their lives, and his concern for her despite the fact they were strangers. She confessed to deep feelings of gratitude and the beginnings of stronger feelings toward him. He admired her good sense, her fortitude, her presence of mind and especially her willingness to share his fate. Against the backdrop of the Atlantic Ocean, endless sky and uncertain future they became engaged. When they were finally rescued, Miss Onslow and Mr. Ridge were sunburned, starved and exhausted, but happy to be alive. After Mr. Ridge and Miss Onslow were rescued, he told her that duty and his conscience forced him to make a confession. The sinking of the Pulaski caused him to lose his entire $25,000 net worth. He told her that he was in poverty “to his very lips.” He offered to release her from their engagement if she chose to leave him. Bursting into tears at the thought of separating from him, Miss Onslow asked him if he thought that the lack of money could change the importance of what they had survived together. He assured her that he would repeatedly endure the same trials and tribulations for her and expressed his happiness at her willingness to marry him even though he didn’t have a penny. Their engagement survived and they set a wedding date. Then she told him that she stood to inherit an estate worth $200,000. A luxury steamship that went to the bottom of the Atlantic in 1838 with half its affluent passengers may have been found more than 40 miles off the coast of North Carolina. An underwater exploration venture based out of Florida said it has found enough evidence to convince backers they’ve found the wreck of the Pulaski sitting under 100 feet of water. That evidence includes Spanish and U.S. silver coins that date up until the time of the wreck, along with wreckage that closely parallels survivors’ stories of a starboard boiler explosion that sank the ship in 45 minutes. Read the rest of this story at www.charlotteobserver.com/news/local/article195517649.html. What an amazing story I have lived on the coast of North Carolina my entire life and just read about this shipwreck. Has it been located? Heard that a survivor said captain Dubois was yelling at the engineer to make more steam to speed up. Said the captain in the boiler room was the first to die. My 3rd great grandmother, Martha Meggett Murray, and 2 of her adult children were killed that day. I'm from New Bedford, Ma.,and noticed two survivors were also. Gideon West, a boatswain and W.C.N.Swift. How amazing! I LOVE history of all kinds. I, too, loved "The Wreck of the Mary Deare". The book more so than the movie. Wonderful blog! Glad I found it. My ancestor is William Meggett Murray. He indeed lost his mum in this tragic event.